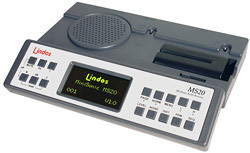 The MiniSonic MS20 is a combined oscillator and measuring set in a stand-alone unit, which is both compact and portable. As well as being a quality tester the MS20 is a precision line-up tool, a stereo PPM, a balanced-unbalanced convertor (both ways), a stereo microphone pre-amp, a headphone amp, and a level convertor. 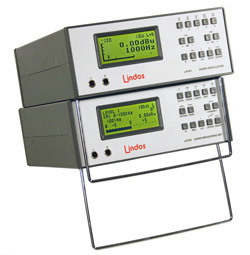 Automated measurements can be made through the use of Lindos sequence testing. In as little as 20 seconds, the MS20 will produce a detailed analysis of your audio equipment, and present the results on the OLED display or on your PC. The LA100 Audio Analyser is a complete audio test system in daily use world-wide by broadcasters, manufacturers, telecom and studio engineers. The flexibility of the system means that testing a broadcast satellite link is as easy as testing a loudspeaker or studio intercom. The LA100 comprises the LA101 Audio Oscillator and the LA102 Audio Measuring Set, which can be supplied separately or together in a single 19" rack mount case (referred to as the LA100R). The units have rechargeable Lithium Ion batteries which trickle-charge when mains power is connected, making them as portable as a multi-meter - ideal for both field and bench applications. 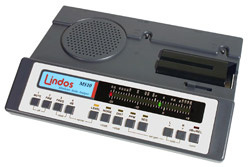 The MiniSonic MS1/MS10 Audio Analyser/Studio Aid is a complete, hand held, two-channel analogue audio test set. As well as being a quality tester it's a precision line-up tool, a stereo PPM, a balanced-unbalanced convertor (both ways),a stereo mic preamp,a headphone amp, and a level convertor! Automated measurements can be made through the use of sequences. This powerful system allows frequency sweeps, noise and distortion measurements and headroom tests to be made with the press of one button. The 'sequence' of tests can be run at any level and any necessary normalisation is taken care of for you. Graphs of frequency response, noise vs. time , phase vs. frequency, distortion vs. level and level vs. level can all be displayed by a computer on an A4 sheet. The DigiSonic is a Windows application that turns your PC sound card into a fully functioning audio test set. As well as providing two channel real-time audio measurements and a full spectrum analyser the DigiSonic can make automated measurements using Sequences. This powerful system allows spot measurements and graphical plots, including level, phase and distortion against frequency to be made in seconds. Results are presented immediately on screen for viewing, printing, saving and tolerance testing. The DigiSonic, MiniSonic and LA100 Audio Analysers can operate either as convenient stand-alone units or under remote control. By running the Lin4win PC software supplied with every unit the user benefits from a clear control panel which displays both channels on large bar graphs as well as digital readouts to 0.01dB resolution. Lin4Win automatically detects which hardware unit is being used and configures the available features accordingly. Sequence results can be read from the measuring set to display a detailed results page (the same is produced through direct printing from an LA100). Scalable graphs of frequency response and the ability to cut and paste results allows the user to easily produce their own in-house reports in what ever DTP package they choose.